The Kansas City Chiefs had an 8-4 record as they faced the Detroit Lions on November 28, 1996, but there were causes for concern. Head Coach Marty Schottenheimer’s team had been to the postseason after each of the past six seasons, although it had come up short of reaching the Super Bowl. The Chiefs had gotten off to a quick start with Steve Bono at quarterback, but he had been benched in favor of backup QB Rich Gannon. 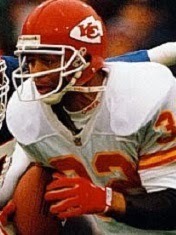 36-year-old RB Marcus Allen (pictured above) was being supplanted by Greg Hill, but was still a master in short yardage situations. The defense, however, was not playing up to past standards. 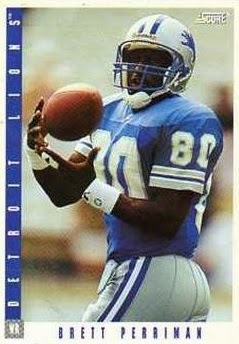 The Lions, coached by Wayne Fontes, were a high-scoring playoff team in 1995 and got off to a 4-2 start in ’96, but then lost five of their next six games and were struggling at 5-7 as they hosted the Chiefs. RB Barry Sanders remained an exciting big-play runner and WR Herman Moore was one of the league’s best receivers, but QB Scott Mitchell was inconsistent and the defense was unable to compensate for the offseason loss of LB Chris Spielman and FS Willie Clay to free agency. DE Robert Porcher was one of the few bright spots in the unit. There were over 75,000 fans in attendance at the Pontiac Silverdome for the Thanksgiving Day matchup. The teams exchanged punts to start the game before the Chiefs put together a nine-play, 91-yard scoring drive. Rich Gannon threw to FB Kimble Anders for a 25-yard gain that was immediately followed by Marcus Allen running for 35 yards to the Detroit 28. Allen finished the series off with a one-yard touchdown carry and Pete Stoyanovich added the extra point. The Lions were driving as the first quarter ended. Scott Mitchell completed a pass to WR Brett Perriman for a 30-yard gain and Barry Sanders had consecutive carries that picked up 21 yards. On the first play of the second quarter, Mitchell connected with WR Johnnie Morton for a 16-yard TD and Jason Hanson tied the score with his successful PAT. Detroit’s defense came through with a big play on the next series when Gannon, back to pass in a third-and-five situation, fumbled while being sacked by Robert Porcher. DT Mike Wells recovered the loose ball in the end zone for a touchdown. The Chiefs punted following their next possession but got the ball back when Mitchell threw a pass that was intercepted by LB Donnie Edwards, who returned it 22 yards to the Detroit 24. The visitors made the most of the opportunity when, following two running plays, Gannon threw to WR Chris Penn for a 17-yard TD. Stoyanovich added the extra point and the contest was again tied at 14-14. The Lions drove into Kansas City territory as Mitchell converted a third-and-nine play with a 10-yard completion to Perriman and Sanders cut outside for a 41-yard gain. But after reaching the KC 25, Sanders threw an option pass that was picked off by FS Mark Collins in the end zone. With 2:38 remaining in the half, the Chiefs moved methodically down the field, but time ran out at the Detroit 32 and the score remained knotted at the intermission. The Lions took the second half kickoff and again advanced into KC territory. 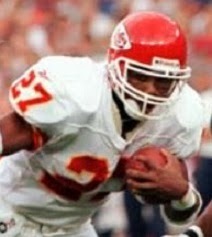 Mitchell completed five passes, but a tipped throw was intercepted by CB Tony Stargell at the Kansas City 18. The Chiefs were forced to punt and this time Detroit didn’t come up empty. The Lions moved 81 yards in 14 plays, the longest a 17-yard pass play from Mitchell to Herman Moore that set up a 13-yard scoring run around end by Sanders. Hanson added the extra point and the score was 21-14 heading into the final period. The Chiefs responded with a nine-play, 64-yard series. Greg Hill (pictured at left) ran effectively, picking up 38 yards in four carries, and Gannon threw to TE Derrick Walker for a nine-yard touchdown. Stoyanovich added the PAT and the score was once again tied. Detroit put together a series that was highlighted by Mitchell throwing to Perriman for a 44-yard gain to the Kansas City two. However, the Lions were unable to reach the end zone from there and settled for a 21-yard Hanson field goal. Still, they were in front by 24-21 midway through the fourth quarter. The Chiefs responded with a long drive of 76 yards in 15 plays that burned nearly eight minutes off the clock. Hill ran the ball seven times for 29 yards and Kansas City converted two third downs. Gannon ran for 16 yards and contributed three short pass completions. Finally, it was the veteran Allen diving for the last yard and a touchdown. Stoyanovich added the extra point and the visitors were up by four with less than a minute remaining to play. Time ran out on the Lions and Kansas City came away the winner by a final score of 28-24. The Chiefs had the edge in total yards (338 to 318), with 243 of that total coming on the ground. Kansas City also had more first downs (26 to 21). The Lions were hurt by three turnovers, to one suffered by the Chiefs. Rich Gannon was efficient as he completed 15 of 18 passes for 120 yards and two touchdowns with none intercepted. He also ran the ball seven times for 45 yards. Greg Hill rushed for 103 yards on 17 carries and Marcus Allen contributed 73 yards on 15 attempts that included two for TDs. Kimble Anders led the team with 5 catches for 44 yards. For the Lions, Scott Mitchell was successful on 18 of 29 throws for 247 yards and a TD, but with two intercepted. Brett Perriman caught 8 of those passes for 131 yards and Herman Moore added 7 receptions for 84 yards. Barry Sanders rushed for 77 yards on 20 carries. The win for the Chiefs marked the season’s high water mark for the club. They lost their last three games to end up with a 9-7 record, second in the AFC West and out of the postseason. Detroit also lost its remaining games to finish at 5-11 and at the bottom of the NFC Central. It marked the end of the line for Coach Fontes after more than eight seasons at the helm (he was elevated to head coach during the 1988 season). Marcus Allen’s two rushing touchdowns gave him 112 and broke a tie with Walter Payton for the NFL career record (he would end up with 123). For the year, Allen rushed for 830 yards on 206 carries (4.0 avg.) and scored nine TDs. Greg Hill gained 645 yards on 135 attempts for a 4.8 average and four touchdowns. Rich Gannon, over the course of four games, completed 60 percent of his passes (54 of 90) for 491 yards with six touchdowns and just one interception. His best days were yet to come – and would come in Oakland, not Kansas City.